This pillow is made from elastic polyurethane memory foam originally developed for NASA. 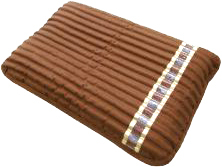 This space age pillow conforms to your head and neck to ensure an ergonomically supporitive sleeping position. The pillow curves downward in the shape your neck and head make when laying in a proper position. Includes a soft velour zip cover so you can remove the outer fabric and easily wash it. Sleep is a necessity, not a luxury. The human body needs so much good sleep a night to replenish itself and allow for proper bodily functions. When your body functions at its peak, your outward appearance becomes the best it can be. The "glow" some people have doesn't just result from the makeup they apply in the morning. It is a direct result of how sound their sleep was the night before. Sleep is an active state every human needs for good health. Sleep helps skin to repair and injuries to heal. Yet millions of Americans of all ages often fail to get a good night's sleep. Correct that with a Richway Amethyst Pillow! Amethyst has been, since ancient times, used for a variety of healing purposes. The name comes from the Ancient Greek a- ("not") and methustos ("intoxicated"). Amethyst as a healing stone is associated with sobering and calming qualities. Amethyst is known protect the mind. It soothes people engaged in constant rigorous mental activity. It has been called "nature's tranquilizer" by many because of it's effectiveness in relaxing the nervous system and has the ability to reduce negativity and alleviate anxiety. It is also known for enhancing mental strength, stability, and vigor. Many use it to fend off depression. There are also many physical ailments for which the healing powers of amethyst are a remedy. As an elixir (solution as a medicinal substance) amethyst is used to treat toothaches, skeletal pains, and other bone and joint-related sicknesses (like arthritis). Amethyst also normalizes the digestive system and is good for heart disorders and blood diseases, as well as a cure for both convulsions and neuralgia. Tourmaline is known to calm a person's nerves when agitated, to regulate hormones, fight against genetic disorders and provide tranquil sleep. Tourmaline is said to dispel fear, negativity and grief. According to ancient cultures, tourmaline of all colors protects the wearer against many dangers and misfortune and promotes self-confidence and courage. Tourmaline is also believed to have healing properties. It has been used to treat anxiety, arthritis, blood disorders and heart disease among other ailments. Richway has borrowed NASA technology in two ways to make the Amethyst and Tourmaline Pillow. NASA developed memory foam for it's astronauts and discovered Far Infrared Rays Richway knows that if anyone is going to know about what's on the cutting edge in technology, it's going to be NASA. Richway has combined two great NASA discoveries to help you sleep better at night. The Amethyst Pillow is the perfect gift as one of the most advanced sleeping aids on the planet!